This part of the GR92 links Tossa de Mar and Sant Feliu on the one hand, and has a branch of the GR92 that runs up to Romanya de la Selva. The actual connection between Tossa de Mar and Sant Feliu doesn't run close to the coast - though there is an extremely bendy coast road between the two towns. Our starting point is in the Urbanisation of Pedralta which are a collection of villas spaced out among the hills just off the road which runs up from an industrial state just outside Sant Feliu. It would be possible to start at Sant Feliu, but instead we're about three-quarters of the way up, and we park in a small no-through road (Carrer Roure) just below the point at which the road and path up the hill separate. This is a very quiet area so there would be no problem taking the road up, but we follow the path which runs parallel to the road as we climb up the hill. The hills around Sant Feliu are more arid and rockier than the Gavarres where we normally walk. The ground underfoot is much sandier and the alzinas more spread-out and despite rain recently, the ground is fast draining and quite dry. As we walk there are views out across to the sea at Sant Feliu and then the coast along Platja d'Aro and up even towards Begur. The path curls away from the road for a while and we can see across the valley of the river Aro across to Sant Cristina d'Aro. Eventually the path we're on meets back up with the road. We turn right and follow the road way for a few hundred metres until we reach a broad clearing with signposts. There would be parking here and the road up is in good condition having been resurfaced recently, so it would be easy to drive up. Taking a route through the clearing we pass, firstly a small chapel and secondly a large boulder which looks unsteady balancing on an outcrop to which a cross has been added. There's also a large pylon and then continuing to follow the path, we reach a viewing area with metal railings that is Puig Mirador. The view is spectacular, with a deep drop separating the viewing area from the hill just across. Behind us the hills are threadbare with expanses of yellow-orange rocks and promentories that limit the number of trees. To the left up the valley we can look towards the hills and mountains of Montseny and across the valley are the tops of the Gavarres. To the right, the sea view and the high-rises of Platja d'Aro. We double back and head straight on across the GR92 up a small incline, and then follow a line of pylons. On this side of the hill, it is almost all rough hills and trees with no habitation visible and just a few tracks running into the hills. 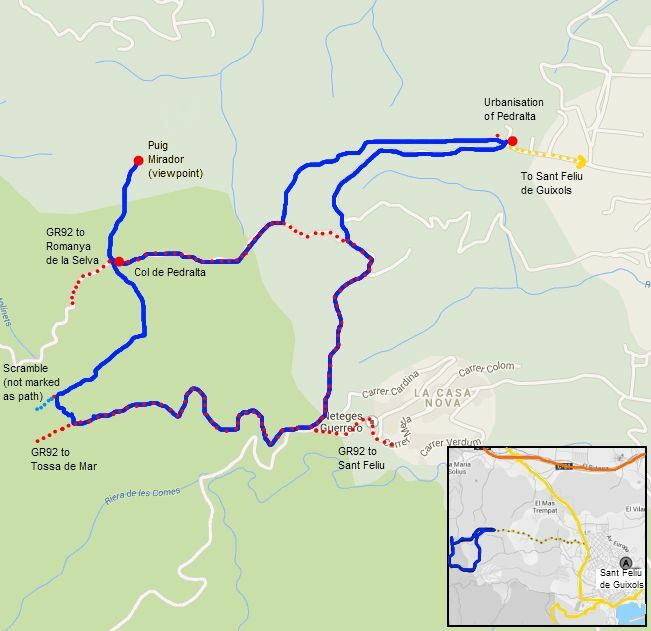 According to the map we are running parallel to a lower stretch of the GR92 as it comes up from Tossa de Mar, so we're hoping for an unmarked route or scramble that we can taken down in order to be able create a loop for the walk. It takes a while but we find a path to the left. It's a little steep but one that other people have used so steady going. At the bottom we're back on the GR92 again. The path though is still a small track and it wends it's way around the side of the hill. We just have to follow the path, and except for one moment under a pylon where someone has scrawled Pedralta on the base suggesting a second path, we follow the track down to a split point (Tres Camins). Instead of taking the Sant Feliu branch we take the Romanya direction behind one of the villas and around the top of a sparsely built estate to get back to the road up to Pedralta, and as it's very quiet we head down the road and back to the car.